Though there's something to be said for reporting to work at a baseball stadium every day, a career within the world of Minor League Baseball entails no small amount of personal sacrifice. Built-in job hazards include low pay, long hours, cramped working conditions, and often the need to relocate in order to achieve professional advancement. And if you're a woman in the industry, these issues are compounded by the simple day-to-day reality of being a distinct minority within a professional ecosystem that has traditionally been the proverbial "boys' club" (in the front office, the press box, and, of course, the clubhouse). But baseball is nothing if not a societal mirror, and just as women have made great advancements in the American workforce at large, they have also made their presence known at Minor League stadiums throughout the country. Perhaps the most striking example of this nationwide influence is the annual "Women in Baseball Leadership Event" that took place at the Baseball Winter Meetings. Heather Raburn, a senior account manager for Minor League Baseball, who helps organize the event, writes that "each year 90 women interact in a setting ... to meet and network, learn from peers, discuss professional interests, exchange ideas, ask for advice and share best practices in a trusting way." The popularity of the Leadership Event (each year it is booked to capacity) illustrates the need for women to do just this. Serving as emcee is Amy Venuto, a front office veteran who currently serves as an executive director for Ripken Baseball (a group that owns and operates the Aberdeen IronBirds, Charlotte Stone Crabs and Augusta GreenJackets). Venuto, who possesses an upbeat personality and is always quick with a kind word or a high-five, is a strong believer in the simple concepts of self-reflection, teamwork and solidarity. "[The Leadership Event] is not supposed to be negative. It's not so that we can come together and talk about the men we work with and what they are doing wrong," she said. "And it's not about trying to be like the men. We have to find the traits that women are strong with and embrace those. ... What we bring are compassion, empathy and intuition, and those are key female traits in leadership." Currently, however, there is a relative dearth of female industry leaders nationwide. 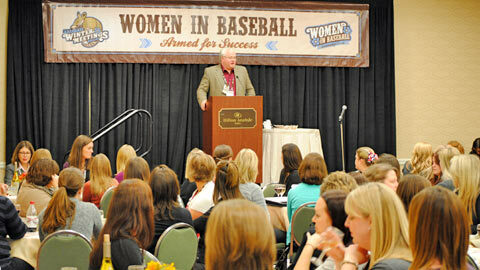 Of the 160 affiliated Minor League teams, just five have a female in the general manager role. One of the reasons for this, Venuto believes, is that women often choose (or are funneled into) organizational roles with little room for advancement. She stresses that women should adopt a whatever-it-takes attitude, including within the higher-pressure and often particularly testosterone-driven world of sales. "If more women are in roles that could lead to general manager, then that could really change things," said Venuto. "We have to become more effective at putting ideas into action, because often there are terrific ideas that aren't really heard. That was one of our topics this year [at the Leadership Event] -- how to go from a peer to a manager." At least Muddy's job is secure as the Cleveland Indians renew their PDC with the SL's Carolina Mudcats. The Jackson Generals announced that Jason Compton has been named general manager of the club. On Feb. 5, The Umpire School's first class will wrap up 28 days of intensive work with PBUC instructors. The Australian Baseball League regular season wraps up Jan. 22, so playoffs can't be very far behind. Four leagues are deep into their playoffs, and the Caribbean Series showdown will get underway Feb. 2. It won't be long before sun-seekers of all stripes head for the stands and Spring Training baseball. Another key challenge for anyone in the industry, but particularly women, is how to handle the demands of the job with the demands of starting and raising a family. After all, 16-hour work days over the course of a 10-game home stand don't exactly go hand-in-hand with involved and proactive parenting. This was certainly a challenge for Venuto, a single mother who raised her daughter, 16-year-old Ally, within ballpark settings. "My daughter was a ballpark rug rat. She loved growing up around baseball, was proud of it and it was a huge part of her life," said Venuto. "But it's very important to have a life outside of baseball, and teams should be able to rotate staff so there are the occasional nights off. It sounds crazy, but there's nothing more valuable in life than being able to see your kid play youth baseball." "For the love of the game" is one of the hoariest of all baseball clichés, but there's a reason it's so widely known. Often it is a lifelong love of the sport that motivates individuals to seek a career within it, and that is a love that knows no gender distinction. The women who work in baseball may come from diverse backgrounds, but this is what unites them. Raburn's family was heavily involved with its local Little League, and she went on to play the game throughout college. Venuto, an Oregon native, recalls going by herself to Portland Beavers games on nights when there were no more than 300 people in the stands. Mollie Radzinski, director of promotions for the South Bend Silver Hawks, remembers riding her bike to the field to watch her brother play Little League and remarks that "there was always something that drew me to baseball." Laura Fragoso, senior vice president for the Round Rock Express, grew up going to Atlanta Braves games with her father, writing that "it was 'our thing' to watch games together." And so it goes. But this leads to one of the most common challenges facing women in baseball -- the perception that this love of the game must be motivated, at least in part, by a desire to get close to the players. "Women must hold themselves to a higher standard if they're going to make it in this industry," said Venuto. "Your actions are going to be put under the microscope, and be the subject of gossip from both men and women." "I've been referred to as a cleat-chaser," said Radzinski, using the widely known slang term for what is, in essence, the baseball groupie. "But we're not here for the players, we're not here to entertain them. ... We have a job to do and may need them to participate in promotions and community relations and appearances. There's a new team coming in each year, so each year it's a fight to get them to respect and understand that." Another common misperception is that women, by default, don't understand baseball. "I've been told countless times that I'm intimidating because I can sit there and have a conversation about sports with guys," said Radzinski. "I'll get these weird looks, like this is not something I'm expected to know about. You just have to break down that wall." Someone who knows all about breaking down that wall is Lisa Winston, who has covered Minor League Baseball as a daily beat writer as well as nationally for Baseball Weekly and MLB.com. As a woman who has logged time in the usually all-male domain of the clubhouse, she has often been asked what she's seen within that environment. "I've never had another woman ask me that, but a lot of guys do," said Winston. "It's not an issue when you do it. It's just one of the non-perks of the job -- you do what you have to do." And though Winston occasionally had to deal with sexist attitudes (she recalls one irate Baseball Weekly reader who opined that a woman's place in the office was to empty the wastebaskets), she is far more likely to tout the accessibility and inclusiveness of Minor League Baseball. "[Being female] may have been more of an advantage than a disadvantage," said Winston, who is starting a consulting company in order to help Minor League players best work with the media. "Guys were comfortable sharing their stories with me, maybe because of my personality, maybe because they were comfortable with their own mothers and sisters. I think part of it was that I didn't have a competitive attitude with them. I couldn't assume to know who they were or what they were doing." In order for women to continue to make strides in the world of Minor League Baseball, they are going to have to work together. This key precept, while obvious in nature, is easier said than done. Venuto recalls reading a book that talked about the concept of the "token woman" in the workplace. "Once a woman becomes that token woman, she might subconsciously subvert the actions of other women because she doesn't want to be replaced," she said. "Once I realized that, it changed the way I work in this business. I never want to hurt the efforts of other female employees." This spirit is what has informed the Women in Baseball Leadership Event, and it seems prevalent throughout the industry. Those who have found their niche are more than willing to give their proverbial two cents. "One seeking to break into baseball should be open-minded and not set on one position or title," wrote Raburn. "The more versatile and creative you are, the more valuable you will be to an organization. And if you want to succeed, get sales experience." "Take that entry-level job -- any internship you can get -- and work hard," wrote Fragoso. "Never wait for someone to tell you what to do, but find things that they don't even realize their organization needs." "The best advice I can give is to take comments in the spirit in which they're meant," added Winston. "In some cases you might be harassed, but in many they're just jerks, socially inept or whatever. Save your wrath for when it really counts." Such perspectives are always beneficial, since establishing one's self and finding true success in the professional baseball realm is a long-term endeavor. But this shouldn't -- and isn't -- serve as a deterrent. "There are challenges in every job, but I have no regrets getting into this line of business," said Radzinski. "This is what I'm going to do until I retire."